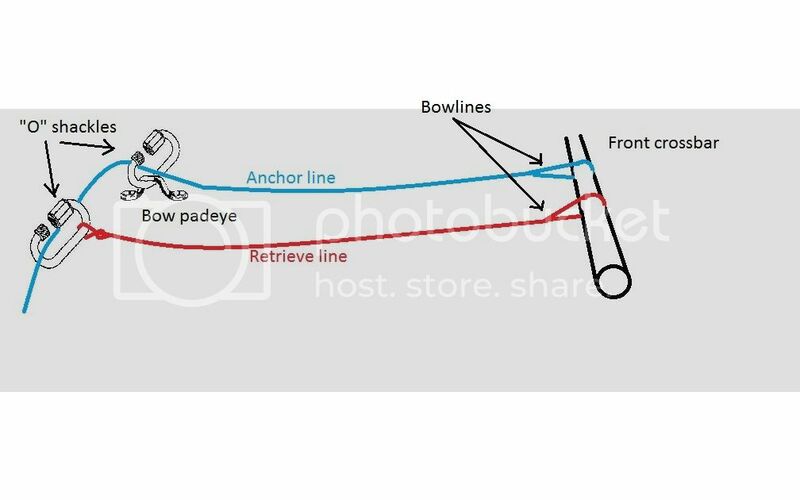 Hobie Forums • View topic - Why a bow line? Geez--Bob, that is some setup. I know there has been talk about coming out with a tandem AI, but I think you need to seriously talk to Hobie about coming out with a larger, solo AI to accomodate your WaterWorld-like accessories. That is an impressive setup, Bob. Nah, we need a kayak-trailer. A floating trailer you tow off the back for all the stuff. You're not the first to suggest that! At Last! The answer to my question "Why a bow line?". It's so you can take it off and tie it to the stern to tow all your gear. Post subject: Re: Why a bow line? I have used a bowline on my kayak since day 1. I use it all the time. Even on land. I pull it around on the ground, tie it when I am floating, throw it to shore to have someone pull me in. I dont see why other do not use it. I have set up a permanent 30 foot line tied to the front crossmember, and passing through a bow fitting. I can then, apart from the usual tethering to an object onshore, add additional line and/or chain, plus (bottom or sea) anchor, with a few shackles. As the line is passing through the bow, my TI lies very nicely on the anchor due to the pull being directly from the bow. However, I also added a separate retrieval line as per the diagram, so I can pull the anchor line back info the cockpit without needing to reach the bow.